Searching for a plumber in Horwich? Thermal Heating Services are here to help. As heating engineers, we cover a large range of domestic and commercial plumbing issues in Horwich. Offering a wide range of services, Thermal Heating Services can help you resolve whatever plumbing issues you’re having. If the service isn’t listed that you’re looking for please don’t hesitate to contact us. Does your boiler need repair? Thermal Heating Services specialise in boiler repairs in Horwich and the surrounding Bolton area. Does your boiler have any of the following common faults? If so we are certain we can help you today. If your problem is more severe don’t hesitate to contact our trained plumbers. We don’t want anyone suffering from a faulty boiler or troublesome central heating that doesn’t work as it should. 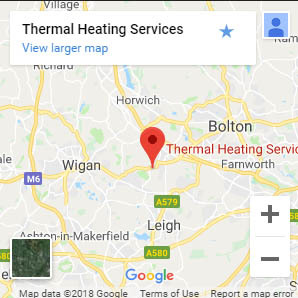 If you’re in Horwich and looking to replace your boiler or central heating system, you can be rest assured that Thermal Heating Services are here to help. Our engineers are Gas Safe Registered and fully qualified to replace your existing boiler or central heating. Are your looking to upgrade to underfloor heating in Horwich? Look no further than Thermal Heating Services. We are professionals when it comes to installing a more energy saving heating system to your home. Underfloor heating is a popular choice when choosing a new heating system for your home or commercial business. It known for its energy saving properties over a central heating system that is used to feed radiators, underfloor heating systems run at much lower temperatures meaning they save money and natural resources. To find out more about our services please don’t hesitate to contact us today.